It's always a big day and usually takes the whole of Sunday to recover. But we are done for another year. We managed to meet up with family friends this year and introduced them to Frostgrave. Big thanks to the lads from Chesterfield Open Gaming Society for spending so much time with us right up to the point the doors close! We played on the above dungeon board, the kids loved it! We also use our homemade dinosaur detector (glass of water...) to check for the appearance of T. Rex. This participation game actually had three games in one! A great day with many excellent games and lots of inspiration for terrain. We've taken a break from our 1066 SAGA campaign, but fear not the final encounter at Hastings is on the horizon! 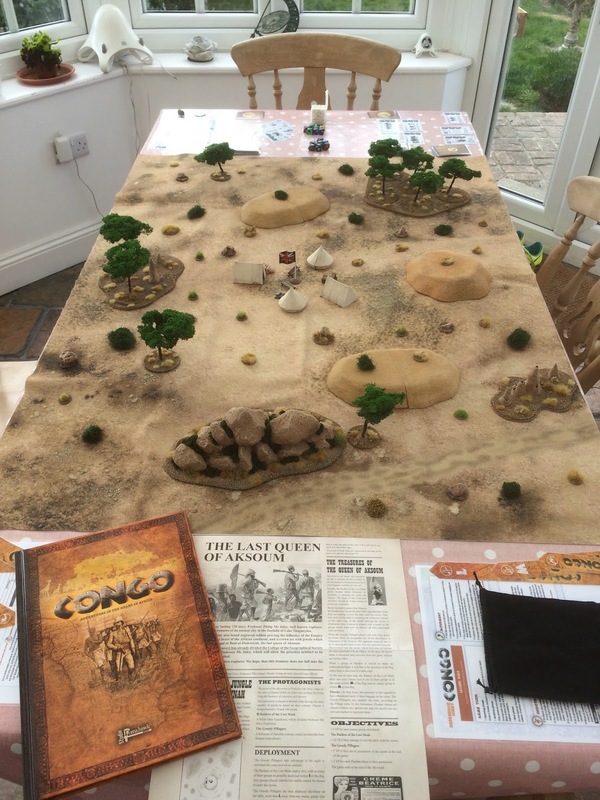 I have finally managed to get enough terrain put together to play Savannah based Congo scenarios. I have stressed over what to do about a Savannah gaming board for weeks. In the end, I chanced up a gaming mat sold by Tiny Wargames and picked one up at Cavalier. Next up was to put together some suitable terrain. I have decided to go for a dry sparsely vegetated look so that I can mix in some of my desert terrain. One of the most iconic images of an African Savannah is probably the Acacia tree and after getting some ideas from A Grab Bag of Games, I set about ordering some cheap eBay trees and bending them into shape. Termite mounds and a Kopje were next. After all, we need somewhere for the lion to spring from! The termite mounds are sold as plastic scatter terrain by Warlord Games and the Kopje is a repainted aquarium piece. So here's the finished terrain put together in advance of a mid-week game. I acted as village elder and showed Lord Nicholson the famous explorer from Herne and Mighty Kyle of the African Kingdoms how to play. Unfortunately, the gods deserted Mighty Kyle and other than bagging a lion in an Acacia copse his last remaining unit of Young Warriors had little to show for their effort. In contrast, the dastardly Lord Nicholson made of with the lost (stolen?!) crown and almost all of the VPs! A great game enjoyed by all and brilliant set of rules.